Leading members of Longford’s Muslim community have called for calm, following the conviction of four men yesterday for assaulting another man inside a mosque over two years ago. Longford Community Islamic Centre, Townspark Industrial Estate, Longford on August 21st, 2015. Two other men, Muhammad Khalid and Quasim Rasool, also with addresses in Cloverwell, Edgeworthstown, Co Longford, were cleared of assaulting Mr Asim. The pair were, however, convicted of having committed public order offences on the same date, resulting in €80 fines being handed out to both men respectively. 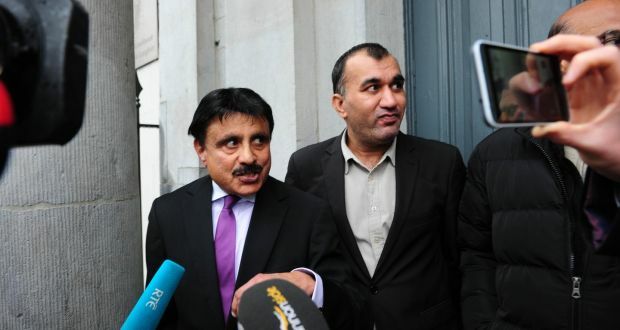 Speaking outside a special sitting of Longford District Court this evening, Dr Syed Ali, the mosque’s trustee and chairman, said he hoped the ruling would bring closure to the episode. “This mosque belongs to all the members of the community and this is not the mosque of one man,” he said, while defending his own role in the incident. “We don’t want to form a new mosque,” he said. The statements followed almost three days of evidence heard before Judge John Cheatle. During the course of those testimonies, the court heard how the planned removal of an imam sparked a row which was witnessed by up to 200 Muslims. Investigating officer Garda Michael Belton said charges were brought against the six men after he observed what he termed the “remnants of a row” inside the mosque which left Mr Asim bleeding from the head and with his robe ripped apart. A number of witnesses inside the mosque on the day took the stand, including the victim, Muhammad Asim. He said he was struck by one of the accused, Mr Abid Hussain, after raising objections to the imam’s impending departure. “He pushed me over the chest and when I said to him, ‘Don’t push me’, he became aggressive and slapped me twice over my face,” said Mr Asim. The court also heard from the mosque’s former imam, Asif Nafaz. He said he believed a decision taken by the mosque’s committee to relieve him of his duties in the days leading up the incident may have prompted the row. Defence barrister Niall Flynn, BL, argued that the state’s case contained “numerous inconsistencies” in the evidence provided by prosecution witnesses and those which were contained in statements. In seeking a dismissal on behalf of his clients, Mr Flynn said Mr Asim had, in fact, been “the “author of his own misfortune” by instigating the entire incident. Judge Cheatle rejected many of those claims, including suggestions that because the incident occurred inside a mosque it was not in a public place. In fining Mr Khalid and Quasim Rasool €80 each for being in breach of public order, Judge Cheatle conceded there was insufficient evidence in determining both men assaulted Mr Asim and dismissed the charges against the pair. Judge Cheatle ordered their four other co-accused to return to court on November 21st with €500 each in compensation for the victim. In the event all four keep to the terms of that order, the judge indicated he would finalise the case by applying the Probation Act. If those terms were not kept, he said the court would hand down a two-month suspended prison term to each of the men.